Luxury Rooms: There are 6 luxury rooms, 1 with a double bed and the other with either a 1 or 2 man sofabed and 2 rooms with a double sofa bed, and 2 with single sofa bed. All luxury rooms have cable t.v ,fridge, balcony, ensuite bathroom, Special Rooms: There are two special rooms with a double bed, balconies, cable t.v. ensuite bathroom and great mountain views! Standard Rooms: There are 2 twin rooms with a single sofa bed, cable t.v, ensuite bathroom ideal for a couple with child or three children, both rooms have nice mountain views, 4 twin rooms comfortable twin rooms with cable t.v. ensuite Luxury rooms have a double or single sofa bed in a separate room and thus can sleep 3/4 people. Some double / twin rooms also have a sofa bed included - please ask for more details, the additional prices for these per night are: 12 Euro, High Season and 6 Euro, Low and Off Season. All of our prices include breakfast. We've just returned from a week in the Avalon Hotel, Bansko. As many other guests who have commented here, we had a great time and were well looked after by James and Varnia. Everyone we met at the hotel was increadibly friendly and the place had a very relaxed vibe. Our room was clean and comfy and we had an amazing view from the balcony of the mountains (when it didnt rain!) and views from the bedroom across the valley and the old town. We loved the goat across the street who came home at 4pm every day! Thanks again James and Varnia. Only one word for the hotel-Excellent. James and Vanya could not do enough for us in reccommending restaurants and organising equipment hire and airport transfers.The hotel was very comfatable with quite a large bedroom . If you want to stay here would you suggest you book early as many people will want to stay here. Stayed here last week and can't praise James and Vanya highly enough. They constantly went out of their way to help us, whether it was offering advice, organising transfers or reseving tables for us at local restaurants. The hotel was very comfatable and had a unique friendly atmosphere. Thanks again for a great week. We couldn't recommend this hotel HIGHLY enough. Just had the best week there. Met some great friends who were guests. Its run by the friendliest people ever, just so helpful. The rooms are great, locations great, the soup was great! What more could you want from a hotel!!! The best in Bansko. Book it right now, if you are very lucky they may have a room left!!!! A group of 17 of us have just returned from a weeks skiing in Bansko, staying in the hotel Avalon. Hotel Avalon is a very comfortable and friendly hotel where guests needs have priority. The food is of a very high standard with a variety of styles of cusine offered. James and Vanya and their staff could not have been more helpful. Nothing was too much trouble, quickly sorting out all of our individual requirements - arranging transfers, trips, skiing passes, lessons and equipment hire with speed and efficiency. Thank you James and Vanya for making our holiday such a memorable happy experience. What can I say ! We were a large group - 18 who stayed at the Avalon for a week in early Feb. We had a great time at the Avalon hotel. The hotel itself is beautiful- sunny, airy , clean, pleasant and welcoming. We slept well, showered in lashes of boiling hot water, used the suana and jacuzzi, sat in the lobby and at the bar, chatted with James, the pleasant and very useful owner, ate breakfast with freshly squeezed orange juice, and used the washing machine and dryer provided in the hotel. We even had a tasty relaxed group meal specially cooked for us. Our kids felt at home and free. We feel that we stumbled on a treasure and hope to be able to come back again! This hotel was lovely. The rooms were clean and spacious and the staff were really helpful. In particular the owners of this hotel go the extra mile to make your stay all the more enjoyable. James the owner gave us some great advice on purchasing property in Bulgaria. You really can't ask more of the staff. I would recommend this hotel to anyone. 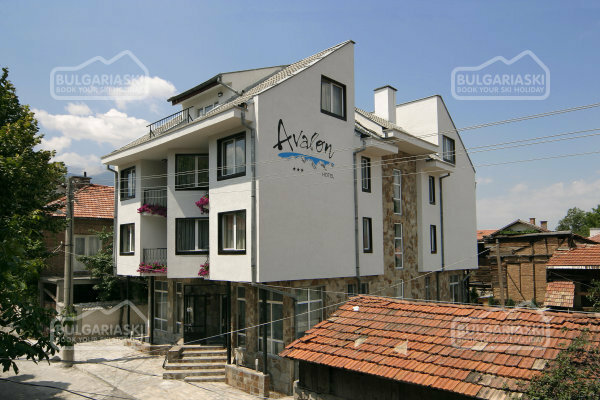 Please, post a comment on Hotel Avalon in Bansko.